What a difference a week makes. 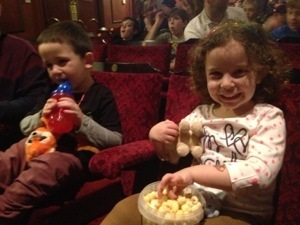 Last Friday I was excited that I would be taking my children to see their first West End show and thanking the gods of calamine lotion that L’s chicken pox had cleared up just in time for us to go. Fast forward a week and I’m now looking back at the past few days with amazement. So much has happened in such a short space of time that I think I need to reflect and take stock. 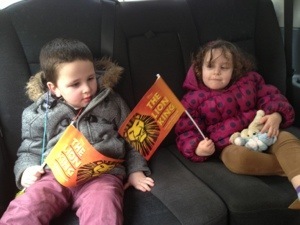 Over 6000 people have now read my post describing our trip to the autism-friendly performance of Lion King. I know some blogs have tens of thousands of hits a week, but for me 6000 in three days is A LOT. I have received literally hundreds of emails and messages from other people who have children or family members with autism, thanking me for my post and for raising awareness of the challenges we face. I have lost count of the number of people who told me my post made them cry. My post was re-blogged, tweeted and linked to more times than I know, including by Theatre Monkey who called it: “The Most Moving Theatre Blog Ever”. I have been asked by Disney’s PR company if they can use my post to promote next year’s performance, and they have circulated it amongst their journalist contacts. I have been thanked by various members of the Lion King crew for being so complimentary about their involvement (They’re thanking me! How ridiculous!) I’ve had phone calls with one of the stars of the show who is now my Facebook friend (I couldn’t be more excited or star-struck if it was George Clooney). I was invited to talk about our experience at the show on a national radio programme, which I did this morning. I have been contacted by the director of another London theatre as well as someone from a small local drama group, both of whom are planning to look into organising similar performances after reading my blog. And possibly most overwhelming of all has been the outpouring of love and encouragement from the hordes of friends and family who have been texting me and sending Facebook messages over the last few days. So please excuse the twee and slightly tenuous Lion King reference but … can I feel the love tonight? Hell yes! It’s certainly been a whirlwind of a week, but I find myself asking – what now? How can I harness this incredible love and support and carry it forward, so that I can continue trying to make the world a better, more accepting and understanding place for J and children like him? I can’t help thinking back to our difficult experience in a large toy store and the negative and dismissive response I had from one reader, and wondering – is it enough? It is unrealistic in the extreme to think I can single-handedly wipe out all traces of prejudice and discrimination from our society. But I can’t help feeling I must be able to do more. This isn’t quite as selfless and altruistic as it sounds … and if I’m being completely honest I think one of my motivations here is fear. Fear of how the world will treat my precious J as he starts to grow up and find his way. And so I find myself in uncharted territory … I am being pushy. I am doing everything I can think of to get more media exposure, so that I can reach the widest audience possible. Obviously if my write-up of last Sunday’s performance leads to more of the same then that will be great. More than great, it would be bloody fantastic. But I need more than that. I need people from outside of the autism community to understand WHY these performances are needed, and WHY children and adults with autism need to engage in behaviour that might be perceived by others as unusual or disruptive or naughty. And then to take that a step further, I want people to understand what they can do to help. I want them to know that it really doesn’t take much. Giving our children a little time to think and formulate a response after asking them a question. Giving parents a smile instead of a disapproving stare. Asking the parent with a tantruming child if they need help, rather than muttering about them behind their back. Recognising the unique way that so many autistic children see the world, and considering what we can learn from them. Looking for ways around their challenges and limitations, rather than writing them off. So I will continue to push for more media coverage … but assuming I don’t become an international writing sensation on the back of this, I need a Plan B. And luckily I have one. I’m planning to utilise all this love that’s been flooding in all week. Because ultimately, the more people who read this blog and other accounts like it, the more we really will start to change the world one person at a time. Up until now I’ve only really ever written this blog for myself – as a cathartic way of dealing with some very difficult times in my life. But now that changes. For the first time I’m asking those of you reading this to share it with your friends, and your friends’ friends’ friends … because maybe my Lion King reference isn’t so twee or tenuous after all. I AM feeling the love, and I can’t help thinking it’s that very love that’s going change the world. From the moment I heard there was to be a one-off autism-friendly performance of The Lion King, I knew we had to go. Musicals have been my greatest passion ever since I was a teenager, and even when I was pregnant with my twins I’d dream of sharing this joyous experience with my children. I would lay in the bath singing show tunes to my bump. In fact I went to see Wicked when I was about three weeks pregnant – before I was even aware that my little ones had been created. Once J’s autism came to light, however, it seemed less likely that he would enjoy a West End show with me. J has hyper-sensitive hearing, can be overwhelmed by large crowds, and does not seem to grasp the need to be quiet in certain situations. So when I heard there was going to be a performance of Lion King aimed specifically at an autistic audience, it seemed too good to be true. I asked my parents how they would feel about buying the tickets as the children’s birthday present, as the performance fell two weeks after their fourth birthday. Of course they said yes, so having bought our tickets for Row H of the stalls, I waited patiently. When the tickets arrived, there was an accompanying letter inviting me to use the resources on the website prior to the performance. Clearly considerable time and effort had gone into producing the visual story which enabled me to prepare J for our visit. It meant he knew what he would see when he arrived, and how the show would start. And indeed, when the big day arrived and we had experienced the excitement of a Tube journey and a taxi ride, J was very excited to see the theatre, exactly as he had seen it on the laptop screen the day before. But it wasn’t until we took our seats in the Lyceum Theatre that I started to realise quite how special an experience this was to be. I looked around as the 2000-seat auditorium began filling with a truly unique audience. All around me were children, teenagers and adults with varying degrees of autism. Many were flapping their hands and jumping up and down. Some were rocking back and forth ferociously in their chairs. Others were making unusual hand gestures, or clapping their hands over their ears. Many were wearing ear-defenders to block out the sounds around them. Some were spinning around in the aisles, others sat on the floor and refused to stand. And the noise level grew and grew, with the sound of people groaning, screeching, hooting and laughing. To the uninitiated this might have looked daunting, even frightening. But to us, the parents and families of people with autism, this was pure happiness. Unlike J, many people with autism are non-verbal. The best way they had to express their growing excitement was to make these strange-sounding noises. And for some, like J, the noise and the crowds were overwhelming. Some made their own noises to block out the sounds around them. But this was fine too. This was part of giving our children an experience many of them would never have otherwise been able to have. And then I realised – a large part of the increased noise level was due to the parents who had excitedly brought their children to this special event. A theatre visit usually involves the audience taking their seats quietly, rustling through their programmes as they wait patiently for the curtain to go up. Not so here. All around me I could hear people introducing themselves and their children, comparing experiences, empathising. We were amongst friends. The show started 15 minutes late. The organisers probably underestimated how long it would take to seat a special-needs audience. In that time, J had insisted on sitting on my lap and fallen asleep. Like many, many children with autism, J is a very poor sleeper. He had been up since 2am. (Incidentally, like many, many autism parents, I am permanently exhausted. I had also been up since 2am!) But at last, two cast members in full costume took to the stage. The audience grew quieter: something was about to happen. And then the man in the lion costume spoke. “My name is George” he said “and I play the part of Scar”. This was clever. This helped the audience differentiate between the actors and the characters. Good start. George went on to speak briefly about what an honour it was to be able to present this unique performance to us. And he meant it. The emotion in his voice was clear. The audience applauded loudly. This made those with hyper-sensitive hearing groan louder. He introduced the woman standing beside him, who plays Rafiki, and explained that she would be singing the first song in the show. Again, a thoughtful measure to help prepare the audience for what would come. “Much too often” said George meaningfully “autism has to adapt to society. It’s about time a little bit of society adapted to autism!” The audience erupted. I burst into tears. The woman next to me handed me a tissue, as she also stifled a sob. They understood. All these people around me – the families, the cast and crew, the staff of the theatre and the National Autistic Society and Disney who were lining the auditorium ready to help: all of them understood. I cannot imagine the cast have ever performed to an audience like it. At times the noise in the auditorium made it difficult to hear what was happening on stage. But at no point was anyone shushed. No-one was on the receiving end of dirty looks, whispered comments about controlling our children, tutting and head-shaking. It was all OK. In front of me a teenage boy was rocking so hard in his chair that his mother tried to stop him and turned to apologise to the woman behind her. “Please don’t” said the woman. “He’s absolutely fine”. Each time Scar, the baddie, appeared on stage, a young man wearing ear defenders leapt into his father’s lap and buried his face in his neck. Behind me another teenage boy was completely overwhelmed. He stood up waving and flapping his arms violently. “Please sit Paul!” his mother pleaded. “Please just try!” In the end his father took him out of the auditorium, where they went instead to the thoughtfully planned relaxation area, full of large bean bags and tactile, sensory toys. Next to Paul’s mother, another boy was so lost in the wonder of the African drumming that he sat with his eyes closed, drumming his own beat loudly and enthusiastically on his thighs. Two rows in front of me a girl put her coat over her head as the show started. She left it there for the entire performance and no-one from her family asked her to remove it. Every time the audience applauded at the end of a song or scene, J clapped his hands over his ears and shouted until the applause subsided. He then thought of something funny his cousin had done last month and repeated what she had said again and again, very loudly, for about 20 minutes. When the song Hakuna Matata started J recognised it and tried to sing along. The words of the song seemed so poignant at that moment. “It means no worries for the rest of your days.” Sadly I realised, the opposite would be true for so many of the young people sitting around me. The challenges caused by their autism will likely mean the rest of their days will be fraught with worries. But, for that moment at least, their worries were suspended. Hakuna Matata for a few hours. When the curtain fell for the interval I needed to change J’s nappy. We went to the relaxation area where I sat on a bean bag to do it. No-one batted an eyelid. Every parent I passed wanted to engage me in conversation – about the show, about our children, about autism. I remarked how wonderful it was to allow J to behave exactly as he needed to, without fear of being judged as a bad parent. Everyone I spoke to felt the same. The second half passed with as much noise and excitement as the first. Paul finally returned to his seat behind me, where his mother kissed him exhuberantly saying “Thank you Paul! Thank you for coming back! See how beautiful it is!” The drumming boy laughed loudly and hysterically at Timon and Pumbaa. J screeched with laughter when, on the stage, Zazu walked into the wall. “Zazu went crash!” he shouted joyfully. I wondered at times whether the cast had fully realised what they were letting themselves in for. It must have been the first time in their acting careers that they had to fight to make themselves heard. I hoped they could feel how enraptured we were by the beauty of their singing and the breathtaking staging. When the final curtain call came, I leapt to my feet with J in my arms. I whooped and cheered for all I was worth. J hated this and screamed at me to be quiet, but I couldn’t. I had to let all those responsible for this incredible production know just how grateful I was and how much it had meant to me. As the house lights went up and we put our coats on, J started sobbing. “I don’t want to leave Lion King!” he pleaded. “I want to stay at Lion King!” He was placated by the Lion King flag handed to him by a smiling staff member on the way out, which is now taped proudly to his bedroom wall. I don’t know whether the cast and crew of Sunday’s performance realise quite what an important thing they did. This went way beyond allowing people with autism to experience a trip to the theatre. What this performance did was to make us normal. For a few hours, our children and family members were free to be themselves and to behave however they needed to, without fear of judgement or retribution. For a few hours, we did not feel the need to apologise for our own children. For a few hours, no-one felt they had to explain anything. For a few hours we had no worries. Hakuna Matata.